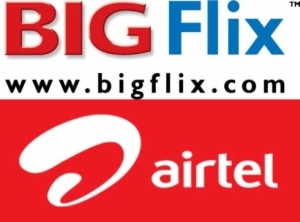 Bharti Airtel has announced the launch of Airtel movies, a digital video service that is online and on-demand, in alliance with BigFlix, the home entertainment division of Reliance Anil Dhirubhai Ambani (ADA) Group. Airtel broadband customers can avail the Airtel movies service as a monthly add-on pack. The service will provide the customers with an online digital video library with DVD quality content that can be accessed on Wi-Fi. The customers can use their computers, laptops or tablets at home to get access to 500 movies, 100 TV shows, 100 trailers and 100 music videos. New videos will also be added to the available data in the future. Currently there is only one plan available, it costs Rs.229 per month and allows the subscribers unlimited access. "We will look to continuously refresh content in response to feedback and customer needs," Girish Mehta, Chief Marketing Officer, Telemedia Services, Bharti Airtel said in a statement. Except for users in Punjab, watching 'Airtel Movies' will not add to the customers' broadband plan data usage, hence the Rs.229 pack will allow subscribers unlimited access at no additional costs. Although Watching 'Airtel Movies' will require standard Macromedia Flash player version 10.2. "The launch of Airtel Movies powered by BigFlix will allow consumers to watch movies and TV shows of their choice sitting in their homes through their Airtel broadband connection that is free of advertisements," said Manish Agarwal, Chief Executive Officer, Reliance Entertainment Digital. The biggest drawback of the service is the content available as of now, most of the popular TV shows are not available and additionally the Hollywood movies collection is also poor. Airtel and Bigflix will have to drastically improve on the available content if they plan to attract customers. Earlier, Airtel's DTH company airtel digital TV had added two new interactive services- iDarshan and iGoodlife. While iDarshan is powered by Shemaroo and Divinevistaas and focuses on devotional content, iGoodlife is powered by NDTV GoodTimes and focuses on Cooking, Health, Lifestyle and Family. The company had also launched a new service called Airtel broadband TV (accessed at Airtellive.com), that allowed customers to watch live television on their laptops.